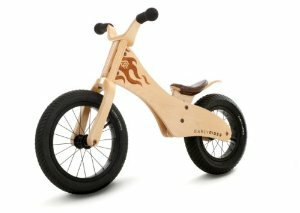 Early rider offer some of the best quality wooden balance bikes around - they are brilliant bikes made from high quality birch wood, offer a range of superb features and look stylish with a sleek design and fiery emblem on the frame. If you have looked through all of the reviews and decided on an Early Rider balance bike as the most suitable for your child (great choice by the way), then a quandary that you may find yourself in as a parent is whether to buy the Early Rider Lite or to go for the Early Rider classic - so we thought it would be useful to compare the two bikes for you! Although the Early Rider Classic is a superb balance bike, and one of the leading bikes on the market - some children will be on their feet and ready to ride before they are big enough to handle the Classic. This is where the Early Rider Lite really comes into it's own, as it is designed for children as young as 18-20 months with a range of features to suit. The first main difference that you will notice is the weight of the bike. The Early Rider Lite weighs in at just 3.25kg, making it one of the lightest wooden balance bikes available and easy to handle for smaller children. The Classic weighs 4.25kg in comparison, which would make it quite difficult for a smaller 2 year old to get to grips with - but on the other hand the Classic will be able to support older children as they grow and is suitable for riders up to 5 years of age. Both bikes offer adjustable seat heights, which means that you can increase the height of the saddle as your child grows. One of the most important aspects to consider when buying a balance bike is the seat height (check out our saddle height guide), and if you buy a bike where the saddle is too high then your child will be disappointed as they won't be able to ride it properly! The lowest saddle height on the Early Rider Lite is just 29cm, so this will be suitable for younger children and is comparable with models such as the Puky LRM Balance bike. The lowest seat height on the Classic is 31.5cm. The third main difference between the bikes is the tyres. Both bikes come equipped with pneumatic (air) tyres, but the Early Rider Lite offers 12" tyres at the front and rear, while the Classic features a 14" front tyre and a 'Fat Boy' 12" tyre on the rear. These tyres help to support the sturdier frame of the Early Rider Classic, with the Lite offering speed and agility. As the Early Rider Lite is a smaller bike, it is slightly cheaper than the Classic and can be purchased for around £130. The Classic will set you back closer to £140. We hope this helps to summarise the main differences between Early Rider Lite and Early Rider classic. 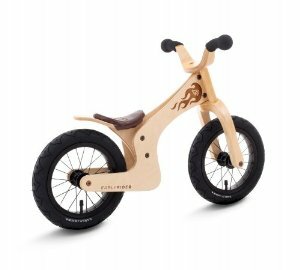 They are both very high quality balance bikes, and both models come equipped with a range of other features including the stylish wooden frame, an embossed faux leather seat and a dual steering system. The Early Rider Lite is built for younger children, so if your child is ready for a balance bike by the age of 18 - 20 months then this will be the bike for you. If they master balance, steering and riding by the age of 4 then they should be ready for a pedal bike by this age, but if you think your child will be enjoying their balance to the age of 4 and beyond then the Early Rider Classic will be a better investment. Happy riding!